As much as I love the flavors of simple ingredients, sometimes I do indulge myself a little and delve into the harder-to-find ones. It's a fun challenge every once in a while, and one can make a dish unable to be replicated based on the variation of ingredient sources. For this smoky pappardelle dish, I used everything from the farmers' market save for the salt and pepper (still artisan, small batch). I hesitated on putting this recipe up because of the difficulty of compiling all of these ingredients together by one person but I felt it was necessary to share the idea of it all in case you wanted to replace components here and there. At the very least, you can take a peek into what goes on in my mind when I put a dish together. 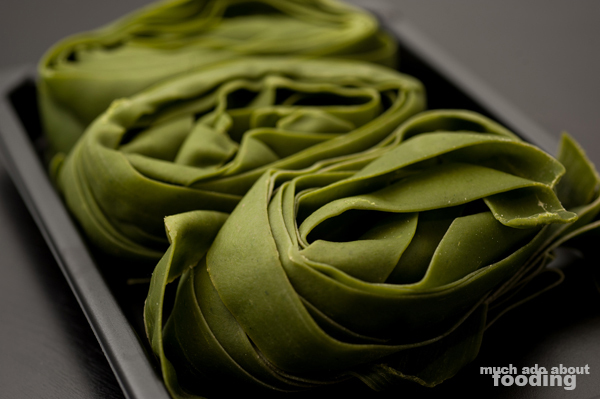 Fresh pasta requires less time in boiling water before it is ready to use. You can also just saute it quickly on a skillet to bring it to cooked state. I used 1 Tbsp of smoked olive oil on a skillet and toss on the pasta, stirring until the pieces separated. Set aside. 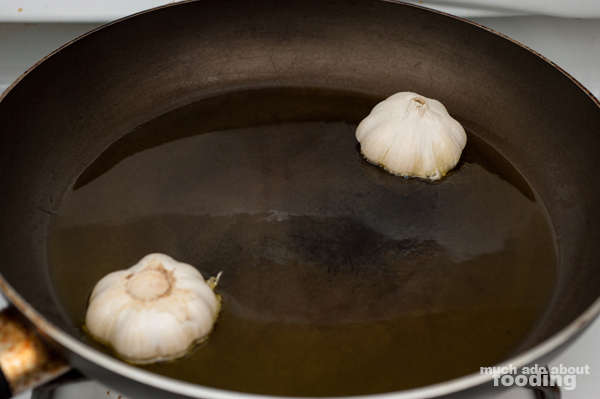 For the other ingredients, heat up two halved bulbs of garlic, cut side down, with remaining smoked olive oil. Saute sliced shallots. 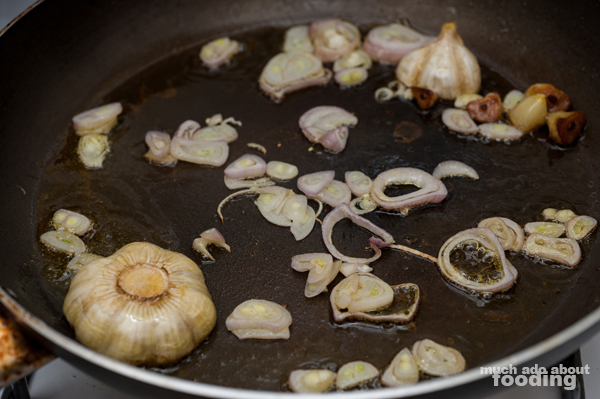 The garlic will seep into the oil and impart its flavor on the other ingredients. Crisp up chanterelle mushrooms on the skillet next. In a small saucepan, bring water to a boil and add spinach until barely wilting. Drain. 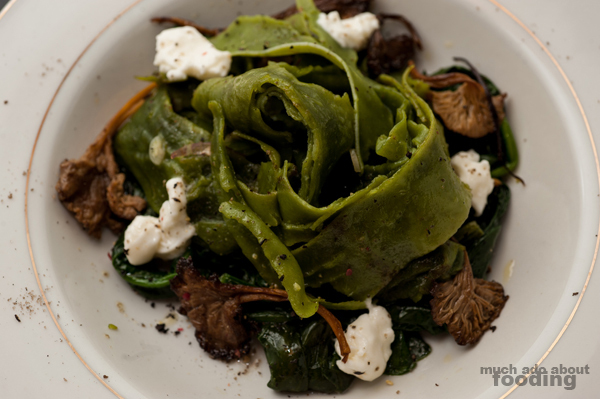 To plate, place wilted spinach first. 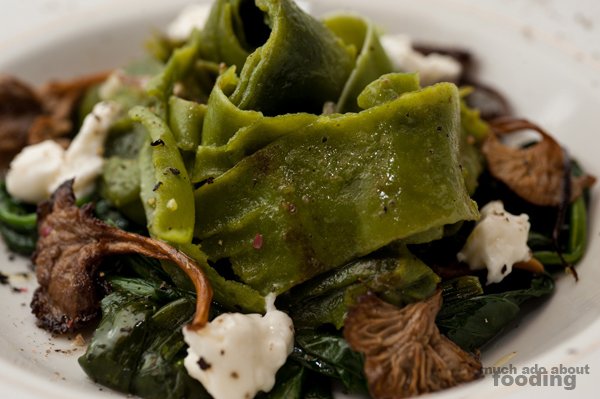 Then heap on smoky pappardelle. Scatter chanterelles around. Tear burrata into pieces and scatter. Sprinkle with smoked alderwood sea salt, and crack rainbow peppercorns on top. Serve and enjoy!